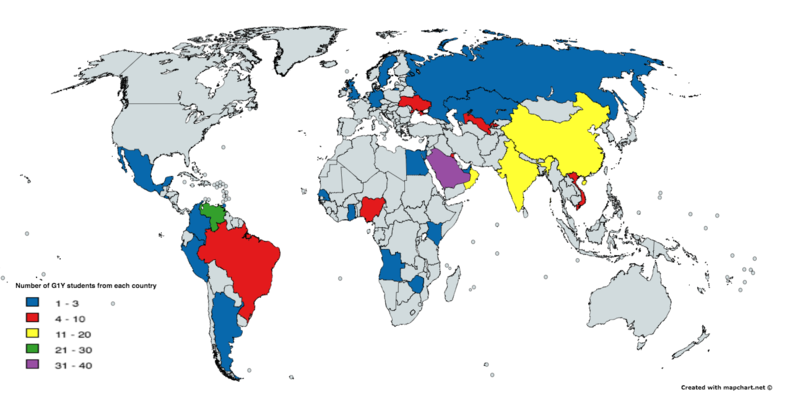 This map illustrates the 30 countries from which Global First Year’s more than 150 international students originate. Growing up in Ho Chi Minh City, Vietnam, Ky Nguyen was shy and seldom ventured outside of her social circle. Giving a speech in English in front of a class in the United States would have been a daunting prospect. Then she enrolled in the Global First Year program (G1Y) at FIU. The program helps international students adapt to college life in the United States both culturally and academically. The program was created through a partnership between FIU and Shorelight Education, an international company that recruits college students for study abroad and matches them with schools that best fit their aspirations. Students and their families pay for the additional guidance that will help them get the most from their American college experience. 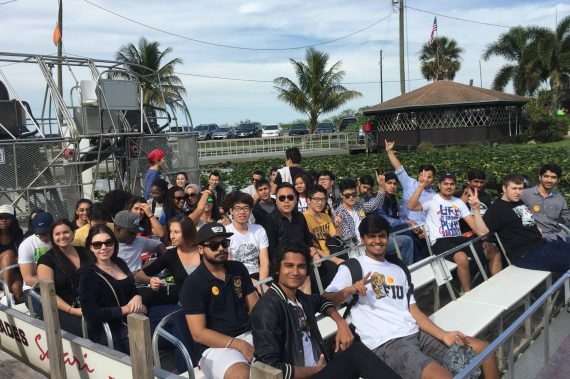 FIU’s program started in Fall 2015 and to date has welcomed more than 150 international students representing 30 countries. One hundred-forty more students are expected to join the growing program this fall. Like any other FIU freshman, G1Y students take courses that fulfill core requirements. They also enroll in supplementary courses that teach them to write research papers and argumentative essays at a college level, as well as develop their English language skills. Students who need more help can enroll in the English Language Institute. The extra coursework also helps them engage with the other students in the classroom and, equally important, with the professor, something that can be difficult for students from countries where discourse or debate with a teacher is uncommon. Jay Vanparia, a sophomore hospitality management student from India, said it took him some time to get used to classes at FIU as schools in India focus mainly on memorization and information recall. But he appreciates the learning support and on-campus resources available at FIU, a facet of university life not emphasized back in India. “We don’t really get a lot of resources. And it is really hard to get involved on campus [in India] because, since there are a lot of people, there is a lot of competition, and there is a limited amount of opportunities for everyone,” Vanparia said. G1Y staff helped Vanparia find ways to participate on campus. He writes for FIU Student Media, and he will serve as an orientation leader for the next cohort of G1Y students and as a peer mentor in an upcoming First-Year Experience course. Outside the classroom G1Y students are part of a living-and-learning community. 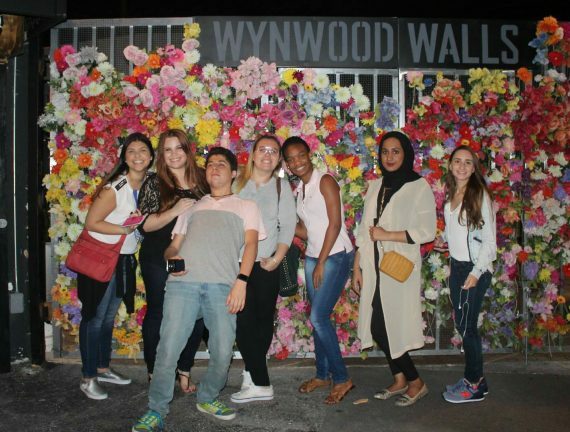 As a group, they tour local attractions such as the Wynwood art district and go to Miami Heat and other sporting events to experience South Florida culture. They take part in FIU events like football tailgates to get to know the American college-student lifestyle. They even take guided trips to Target and the mall at the beginning of the semester to see how shopping works here. Stephen Fain, a professor emeritus who today manages the partnership with Shorelight, said it’s important to help international students break out of their shell in this way because when they move here, they don’t often find the cultural and social experiences to which they’re accustomed, and it can make transitioning to life at FIU hard. Idarabasi Akpan, a sophomore biology major from Nigeria, got more than she bargained for out of the program. Though she had expected the program would help her make friends in a foreign place, she hadn’t expected her classmates and even the program staff would end up being her family away from home. Nguyen, the sophomore international business major who was once too nervous to speak in front of a class, feels the program was an invaluable experience that encouraged her to get out of her comfort zone. It helped her build the English skills and confidence to stand up in front her peers at her cohort’s progression ceremony to talk about her experience as a G1Y student. This is a most valuable program because being an international student isn’t easy, given our complex culture and language. Assistance must come from numerous sources to aid these young people embarking on life’s journey. Most struggle in their first year and need guidance from schools’ international departments, immigration protection, host families, concerned neighbors and fellow students, and informative books to extend a cultural helping hand so we all have a win-win situation. Good luck to all at FIU or wherever you study! Exemplary Program! Thank you for sharing!